Grab your backpack and your map because Dora and Boots are starting their early reading journey, and you’re invited to join! Perfect for the younger players who are just learning the alphabet. For years Dora and her bilingual bunch of animated animals have been teaching toddlers and preschoolers about the Spanish language. With Dora ABCs Vol. 1, the explorer and her crew are branching out and focusing on the basics of the English language. There are countless apps available that claim to teach the fundamentals of the alphabet but few actually succeed. Time and again, I’ve seen that my kids are much more engaged and interested in an educational app if they are playing with characters that are already familiar and beloved. 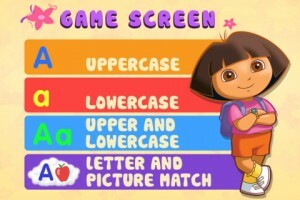 Dora is just that; a regular part of our daily routine, and someone to whom my kids relate. At the opening of the app, I could save my progress under my name, along with three other players’ names. Dora and Boots pop up and offer an easy verbal tutorial and gave me an option to play one of four games addressing different subjects. 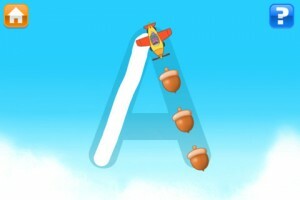 Three mini-games addressing letter tracing left me to drag a skywriting plane to follow acorns in the shape of an uppercase or lowercase letter and then directed me to drag more acorns to the outline of a shape. The fourth mini-game gave me a letter displayed in both forms in a cloud, surrounded by different objects. I had to drag each object beginning with the corresponding letter into the cloud. Every mini-game has several options: While the gameplay continued in alphabetical order, I could skip to any letter by tapping the “abc” icon square in the bottom left corner of the screen. The upper right corner displayed a question mark that repeated the verbal instructions for the game I was currently playing. The home bottom located upper left allowed me to change the game or change the player. The ease of play left little room for younger players to get confused or frustrated, or accidentally hit a button that would leave the current screen. Beside each name saved in the game is a report card that offers parents an overview of their child’s progress as well as a brief synopsis of the foundational skills being taught in the app: “Curriculum Overview: Recognizing and writing letters (upper and lowercase) and associating those letters with sounds. Once children are able to hear and discriminate sounds (phonemes) in words, they are ready to associate or symbolize those phonemes with letters.” This section also shows the players’ progress in a percentage form as they work through the alphabet. 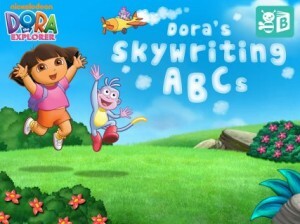 While there are other free apps, Dora ABCs Vol. 1 is well worth the nearly $4 download price. Not only can the purchase be played on both the iPad and iPhone (incidentally, this mobility has saved a few grocery shopping trips in the recent days) but it is also easy for the kiddos. There is very little margin for error and no in-app purchases or ads to sidetrack little ones. I’m now really excited to download the remaining two volumes when my kids work through the first. •A tap and drag game to put letters in the correct holes. •A new game, Letter and Picture Match, reinforces initial letter sounds by grouping pictures that start with the same sound.